This bag is constructed the same way as Foxy (see previous post). 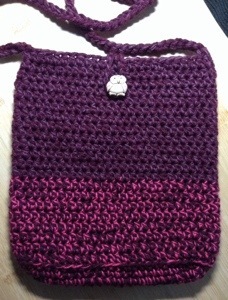 This time, I used Currant Brava Worsted and pink and burgundy elann micro cotton. And an owl button. 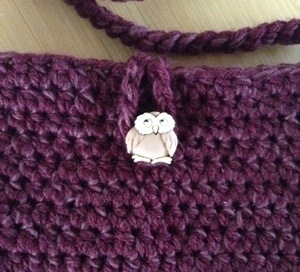 I made sure to be the passenger on our errands this weekend – Tai Chi Man drives, I crochet! Every minute counts. I have some disappointment to share today. Knitpicks, whose Brava I have so loved in the 18 months since I placed that large order, has moved production from Turkey to China. I am not philosophically opposed to things made in China, BUT people in the Knitpicks Lovers forum on Ravelry have been discussing the look and feel and quality of the latest skeins of Brava to appear in their mailboxes and no one is happy. Since the recent move, the yarn has been more shiny, the colours different and in some cases the thickness irregular. In other words, no better than cheap big box store stuff. This news, following on the heels of all the complaints about the Harmony (or should I say Rainbow Wood) needles since they moved production from India to China, has meant I am very unlikely to ever buy from them again. The interchangeable needles and the Brava were two of the best things about KP, as far as I was concerned, and both have declined. I’ve seen so many complaints on Ravelry in a number of forums about inaccurate sizing, thicker cables, things coming apart in their needle sets, including Sunstruck and Caspian. Yeah, customer service might be awesome, but I’d prefer to get a quality product in the first place, not be calling to complain and get replacements all the time. I just logged in to my KP account and changed my preferences to stop the email newsletters etc. I have no plans to buy from them again, the trust is gone, and unless there are some radical changes (like going back to the original manufacturers) I am not interested. Well, I have been cheering myself up with some granny square crochet tonight. More about that tomorrow, no doubt.